Less than two weeks from now, on Dec. 6, anyone over the age of 21 will be able to light a joint in Washington state and, practically speaking, there's nothing the government can really do to stop that. The same will be true in Colorado within a matter of weeks. Smoking marijuana there will soon be legal under state law because of the two initiatives -- Initiative 502 in Washington and Amendment 64 in Colorado -- that passed on Election Day with strong support. The push to legalize recreational marijuana was so successful, in fact, that the Colorado amendment received more votes than President Obama did on the Nov. 6 ballot in that state. Public sentiment, however, doesn't change the fact that marijuana use -- whether it's recreational or medical -- is still very much against federal law. As these two states begin to set up a framework to tax and regulate the drug, they will at some point have to confront the conflict they've created with Washington. Mr. Obama's Justice Department has yet to say how it plans to respond. The department could take any number of actions -- among its options are filing a lawsuit against the states, taking law enforcement into its own hands, or taking a more hands-off approach. In the meantime, lawmakers are waking up to the fact that their constituents are clearly calling for some kind of change in the nation's drug laws. A group of congressmen is urging the federal government to leave Washington and Colorado alone for now. Additionally, some lawmakers have filed legislation to amend the Controlled Substances Act. "It's just a matter of time for the laws to catch up to reality," Rep. Jared Polis, D-Colo., told CBSNews.com. Until those laws catch up with reality, state lawmakers are going to respect voters' demands and start implementing the new laws. In Washington, adults will be free to possess up to an ounce of marijuana starting Dec. 6. The Washington State Liquor Control Board has until Dec. 2013 to draft all the rules pertaining to growing, processing, retailing and possessing marijuana. After that, the board will be in charge of licensing retailers. In Colorado, Gov. John Hickenlooper has until Jan. 5 to sign a proclamation making Amendment 64 part of the state constitution. The governor has said he'll honor the election results, even though he opposed the amendment. Once the proclamation is signed, adults will be permitted to possess up to an ounce of marijuana and up to six plants. From there, the state legislature and agencies like the Colorado Department of Revenue have about a year to draft regulations and prepare for the retail sales of marijuana. Federal officials, meanwhile, are discussing the matter with Hickenlooper and Washington Gov. Christine Gregoire. The only public comment released so far simply acknowledged that the new state rules violate federal law. "The Department's enforcement of the Controlled Substances Act remains unchanged," Justice Department spokeswoman Nanda Chitre said in a statement. "In enacting the Controlled Substances Act, Congress determined that marijuana is a Schedule I controlled substance. We are reviewing the ballot initiatives and have no additional comment at this time." For the time being, individual marijuana users in Colorado and Washington should be "well insulated" from federal authorities, according to Sam Kamin, a professor at the University of Denver's Sturm College of Law who researches marijuana policy. "The federal government still criminalizes a lot of that behavior but has said it's not interested in individual users," he told CBSNews.com. Furthermore, the federal government can't force states to criminalize marijuana use. What it can do is charge that Colorado's or Washington state's retail provisions conflict with the Controlled Substances Act -- that's essentially the tactic the feds used to sue Arizona over immigration, Kamin explained. "While they couldn't force Arizona to enforce immigration laws, they could sue against provisions in direct conflict with it," he said. In addition to suing the states, the federal government could threaten to withhold state funding to state and local law enforcement until they enforce federal laws. It could also make life difficult for marijuana retailers through the IRS or other legal outlets. There's always the chance, though, that the federal government could opt to let the states carry out their experiment with recreational marijuana. "We hope they will allow Colorado and Washington to be the laboratories of democracy," said Art Way, the Colorado senior drug policy manager for the Drug Policy Alliance. "The fact that 3 million people voted for I-502 and Amendment 64 shows they need to take another look and change their stance." If not for high-minded reasons such as supporting democracy, the federal government could leave the states alone for practical reasons. Way pointed out that the federal government hasn't bothered to sue any of the states that have legalized medical marijuana (after the 2012 elections, 18 states plus the District of Columbia allow medical marijuana use). "Hopefully it's because they don't believe they have a strong case," Way said. In 2009, Mr. Obama's Justice Department released the Ogden memo, explaining it would not make going after medical marijuana users a priority, even though any marijuana use violates the Controlled Substances Act. Nevertheless, the Obama administration has cracked down on hundreds of marijuana dispensaries, particularly in California, including sites that were in full compliance with state laws. In a 2011 memo, the Justice Department clarified that the Ogden memo was meant to apply only to individual medical marijuana users -- "not commercial operations cultivating, selling or distributing marijuana." The federal crackdown focused largely on California's medical marijuana operations, and not Colorado's, because Colorado has more stringent regulations in place, both Kamin and Way said. "Colorado tried to keep the criminal element out of it, tried to keep it out of the hands of children... We sort took all the precautions that California did not." Added Way, "The fact that the Colorado non-medical initiative in many ways mirrors the current medical marijuana framework is a positive for Colorado." While it may be a good sign, Kamin said supporters of recreational marijuana shouldn't hold their breath. The establishment of a commercial marijuana market, he said, "is exactly what the federal government has said it won't permit." With that in mind, a handful of bipartisan congressmen led by Rep. Diana DeGette, D-Colo., introduced the "Respect States' and Citizens' Rights Act," which would amend the Controlled Substances Act, barring the federal government from overriding state marijuana laws. Rep. Polis, DeGette and 16 other congressmen also sent a letter to the Justice Department and the Drug Enforcement Agency, asking them to respect those in Colorado and Washington who follow the state laws. "Statutory changes are required in the long run, but the process of lawmaking is very slow," Polis told CBSNews.com. "In the meantime, it is absolutely critical that the Justice Department... implement something like the Ogden memo." 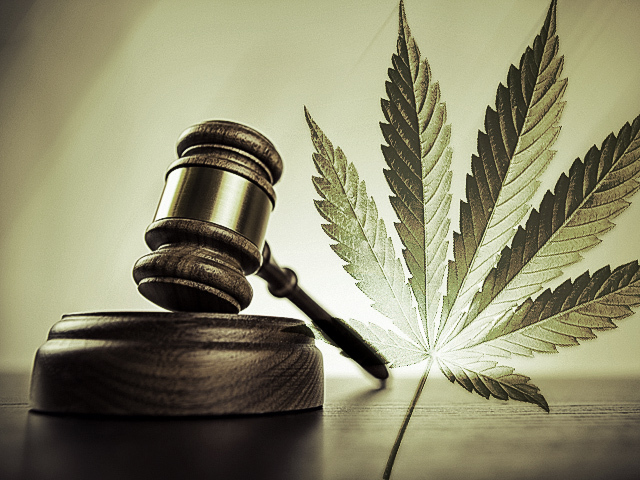 If Congress doesn't feel compelled to act just yet, it may in the future as other states pursue legalization -- Rhode Island and Maine are among the states that could take up the issue in 2013. "We're moving toward a situation where the law in the states is so different from federal law, something has to give," Kamin said.